Android supports mice, keyboards, and even gamepads. On many Android devices, you can connect USB peripherals to your device. On other Android devices, you may need to connect them wirelessly via Bluetooth. Let’s face it, touch controls are terrible for many games. Have you ever tried playing a platformer game on a touchscreen? It’s an exercise in frustration. The good news is that you can connect a game controller to your Android device and play games the way they were meant to be played, whether they’re controller-enabled Android games or old games played via an emulator. 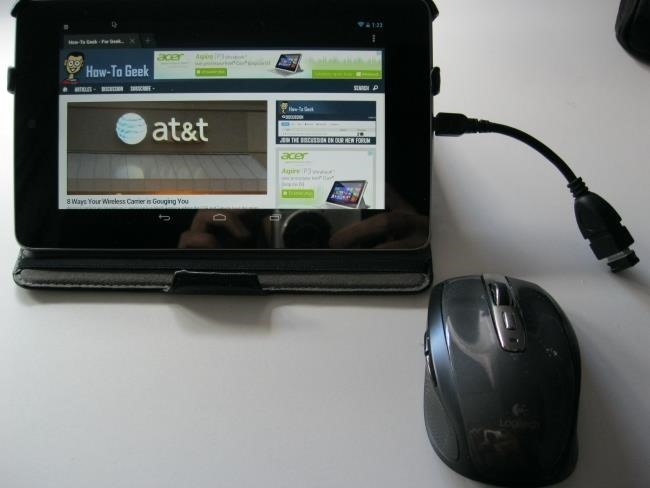 You can connect a mouse to your Android tablet and get a mouse cursor, or connect an Xbox 360 controller and play a game, console-style. You can even connect a keyboard and use keyboard shortcuts like Alt+Tab. USB OTG stands for “USB on the go.” It’s essentially a tiny adapter cable that contains a full USB plug at one end and a micro-USB connector on the other end. It allows you to plug standard USB devices into your Android phone or tablet, including USB drives, mice, keyboards, and Xbox 360 controllers. This should be plug-and-play on newer devices. We did this on a Nexus 7, and everything worked with no additional configuration required. On an older device, you may need to use USB/Joystick Center to make this work — see the last section of this article for more details. You can now fire up games that support controllers and play them with the controller. Some games may have a settings screen where you can select between controller and touch controls, while some games will respond to the controller immediately. For example, Riptide GP offers such a configuration screen, while Sonic games respond to the controller immediately. Android phones and tablets don’t have the standard, full-size USB ports, so you can’t plug a USB peripheral directly into it. To actually connect a USB device to your Android device, you’ll need a USB on-the-go cable. A USB OTG cable is an adapter that plugs into the Micro-USB port on your device and allows you to connect full-size USB peripherals. These cables can be purchased for a dollar or two on a site like Monoprice, or a few bucks more on Amazon. 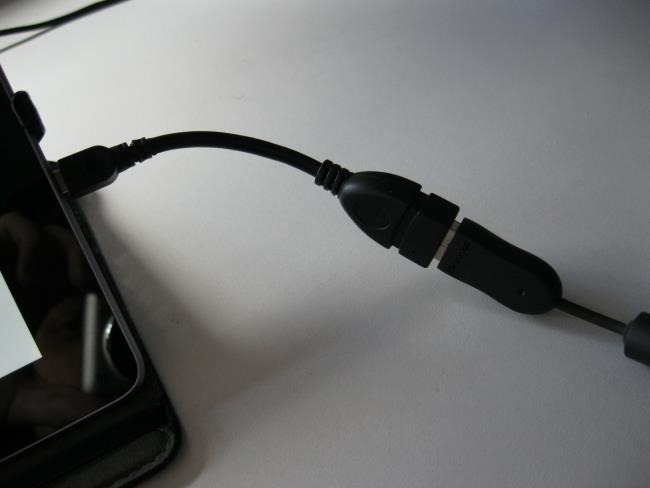 A USB OTG cable may also allow you to use other USB devices with your Android. For example, you can connect a USB flash drive to your Android phone or tablet. Mouse: Connect a mouse and you will see a familiar mouse cursor appear on your screen. The cursor can be used to navigate through Android’s interface, clicking on things you’d normally tap. It works just like it would on a computer. Of course, you can also still reach out and touch the screen while the mouse is connected. Keyboard: Your keyboard should just work when typing in text fields, allowing you to type at a reasonable speed on a mechanical keyboard and see more of the screen by removing the need for the on-screen, touch keyboard. Many keyboard shortcuts work like they do on computers, including Alt+Tab for switching between recent apps and Ctrl + X, C, or V for Cut, Copy, and Paste. Gamepad: The gamepad can be used to navigate through Android’s home screen interface and launch apps, but that’s not the ideal use. You’ll need to use the gamepad with games that support controllers. Some games (like the Sonic platformer games for Android) beg for one and work much better with a controller than with the standard touch-screen controls. It’s possible to use an Xbox 360 controller with unsupported games on Android, just as you can use a controller with unsupported games on Windows. To do this, you’ll need to be using a rooted device. Most people recommend the USB/BT Joystick Center app as the most convenient solution for setting this up, although it will only work on certain devices and certain ROMs. Be prepared for some tweaking if you opt to go this route. Using a wireless Xbox 360 controller is also possible, although it isn’t quite as easy. To do this, you’ll need the same Xbox 360 Wireless Controller Dongle that you’d use to connect your wireless controller to a PC. You can then plug this wireless dongle into the USB OTG cable and connect the dongle to your tablet. This will be enough to make many emulators and games work. However, some games won’t work with this setup. You can find a solution to make the wireless Xbox 360 controller work with more games on the XDA Developers forum. The solution is intended for the Nexus 7, but may work with other Android devices. Bluetooth Controller: Any Bluetooth gamepad can be paired with your Android device using its standard Bluetooth pairing options — no wires required. WiiMote: Check out our guide to connecting your WiiMote to your Android device. A USB OTG cable isn’t the ideal solution for many devices. Wires add a lot of clutter to what should be a portable device. Many devices also don’t support USB OTG cables. If your device doesn’t support USB OTG or you just don’t like wires, you’re still in luck. You can connect wireless Bluetooth mice, keyboards, and gamepads directly to your phone or tablet. 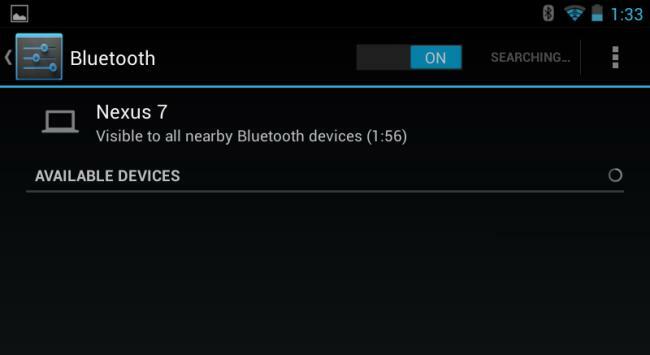 Just use your Android’s Bluetooth settings screen to pair it with your device, just as you’d pair a Bluetooth headset. You’ll find this screen at Settings -> Bluetooth. If you’re shopping for a mouse or keyboard to use with your Android tablet, you’ll probably want to purchase Bluetooth devices for convenience and compatibility. PlayStation 3 Sixaxis Gamepad: You’ll need to be using a rooted Android device. You’ll then need to install the Sixaxis Compatability Checker app to verify your device is compatible with your controller, use the SixaxisPairTool app on a Windows PC to pair your controller with your device, and then install the Sixaxis Controller app on your device. For some great Android games to try your controller with, check out our list of the best Android games. 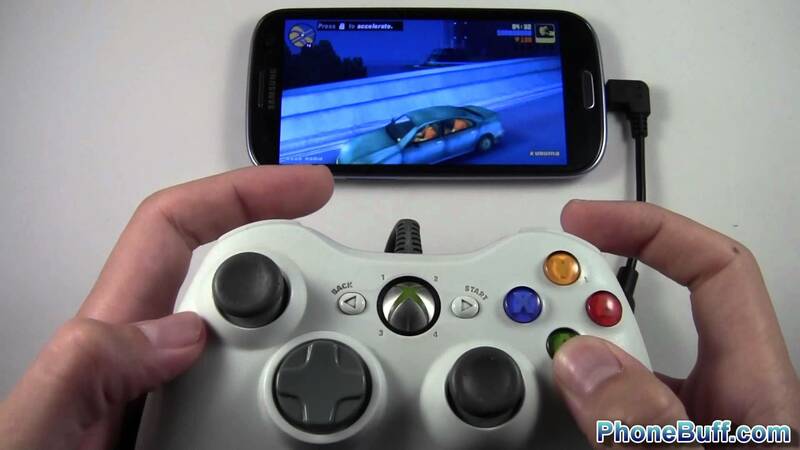 Have you connected a game controller to your Android device? Did it go this easily, or did you need to do more tweaking? Is there a controller that works better than the wired Xbox 360 controller? Leave a comment and share your experiences!